Friends, I didn't want to post leaving on a trip, but now I am back. We were in HOT Kentucky for about 3 fun filled days, meeting relatives we only heard about a few years ago. I love the gorgeous country side in Kentucky. I can see why those who live in the country love it so much. dad and his sister Louise, and then again when the two sisters met. view was fabulous. Here are some of the pictures I took. I am sad to say that the California Redwood tree that my oldest son nurtured since it was a little seedling seen its day. I guess that it didn't like being transplanted. We usually have success when transplanting plants, but then this tree was over 10 feet tall and was in the way of our lemon and pear tree. I hope that the little growth (new growth at the base of the tree) will take hold and survive. Time will tell. My oldest son has been fortunate to be in the geology program at our local public college. These professors are so awesome and very encouraging. The program for biology and geology is the best. My son missed the opportunity last year to go on the trip to the Colorado Plateaus, and this year he almost missed out as well, if it had not been for a student backing out of the trip. My son gets to go on a two trip for his summer class. Bryce Canyon is so beautiful, but it will be HOT! I do know that he will be hiking in Bryce Canyon, something that my dh and I did about 26 years ago. I wished that my son would take his camera, but I understand why he doesn't. P.S. It is now early Monday morning and I have had about 3 1/2 hours of sleep. I am up I guess because I don't want to over sleep. My son wants me to get him up at 5:30 am, which is very unusual. He is all packed which is also unusual. He will have a lot of memories and adventures awaiting him during these two weeks. A few years ago, I was asked by a friend if I could make his wife some new aprons using her old mother's vintage smock apron. I was up for the challenge. The aprons have since faded, from all the washing. I was told that my friend wore her aprons all the time. Well, it was time for some new aprons, so it I was again up for the challenge. I had taken notes-thank goodness and some pictures, which were not all that great, but I did finish one of the aprons. I took the apron over to my friend's house last night and she broke down in tears. She has the sweetest husband. Anyways, my friend's mother's apron was old and worn out and it bore wood stains, since my friend wore that apron while helping her husband stain cabinets in his cabinet business. I thought that I would post the original apron, and the one that I just made. The apron looks better on my friend that it does on my dress form. Well, our online fabric store has been open since Mother's Day. I have been wanting to sell my fabrics, with many of the fabrics that are out of print. 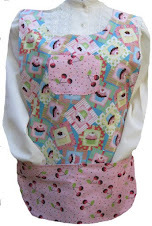 I have been asked time and time again if I sell or would sell my fabrics that I used for custom aprons. My sons gave me the best Mother's Day present ever, and this was it. Of course as my sons were growing up, they had and actually still have clashed. They have their moments when they get along, but they are complete opposites. As they were growing up, I would say that the best Mother's Day gift that they could give me was a day without them arguing. It has been a blessing for that one day a year. I had always wished that they would eventually or actually get along in a timely manner. A few weeks ago, we learned that our youngest son was invited to his friend's (ex-girlfriend's) birthday party in Las Vegas. Originally, the girl's parents were going to drive several young adults including my son to Las Vegas. My son had to make some arrangements with work and school, but one of his professors would not let my son take his exam early unless it was an emergency. My son decided that he couldn't go, but that soon changed when his dad mentioned that our son could rent a car (his car wouldn't make the long drive). I being a mom was concerned about our 21 year old son driving to Las Vegas at night after his evening class. Of course, my son could tell that I would worry and assured me that he would be fine. Just to ease this old woman's mind, my son said that he would give me a call when he reached the rest stops and when he safely arrived at his destination. It is now 1:15 a.m. and I have received one call. Everything is fine. Of course, in my heart, I knew that he would be fine because there was someone far mightier than I watching over my son, but I am still a mom after all, but I should just trust that everything will work out. It is 2 am and my son is now in his hotel room. You see, I think that I know why the party is in Las Vegas. No, my son and his friends are not interested in gambling, but the parents are. Every year for as long as I can remember, they would drive to Las Vegas so that they could gamble. My oldest son will be going on another weekend geology trip to the White Inyos. My son volunteered to go with a fellow student while the student reworks his mapping of the geology. The student lost his map during the last trip, so since a group was going to the White Inyos, the professor said that this student can get a second chance at the mapping. It was felt and I had to agree with this one, that there should be another person (like the buddy system suggested when hiking), in case something happens. It will be a night of little sleep, since the oldest wants me to help to wake him up at 5:45 am. It will be a quiet weekend for sure around here.